This is the first of four articles focused on the Liberating Voices practicums conducted for the two Public Thinking Public Health classes held at Evergreen College at the end of 2009 and beginning of 2010. The actual tools, templates, session plans and reports are available from the Download tab of this site. This article focuses on the overall context and structure for the practicums. The major point of departure based on the work of Christopher Alexander was to apply the Liberating Voices pattern language as a means for cultivating communication systems and structures that strengthen community wellbeing. Human consciousness is wired to recognize patterns that make sense of the complexity of life and enable us to creatively engage in that complexity. Consciously and unconsciously, we depend on identifying and/or generating patterns for guiding and maintaining the flow of energy and meaning throughout the social fabric. Patterns are how we explain why things are working well or not working at all. A pattern language, like Liberating Voices, offers an ever-evolving representation of the whole, an ongoing documentation of insights and dialog starting from more than 85 practitioners, academics, professionals and activists to inform our own perspectives on vexing social issues. We can draw upon that collective wisdom and in turn extend and repair it through specific, concrete applications. 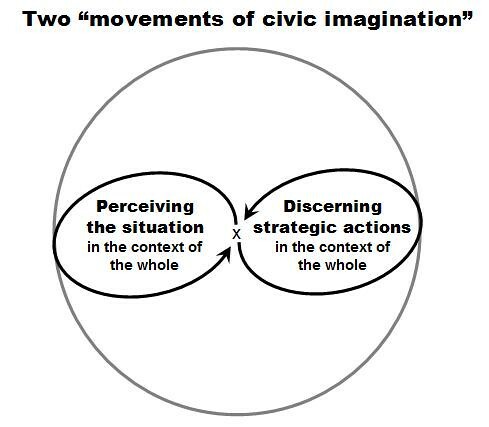 In this context, the four-hour session was divided into two major team-oriented sessions or “movements of civic imagination”: perceiving specific class projects in the context of the whole (as informed by the Liberating Voices pattern language) and discerning concrete actions that emerge from that collective perception. The two main group work sessions utilize representative decks of pattern cards (a complete set of pattern abstract cards is not yet available; these practicums used decks of approximately 65 cards), visual “game boards” for capturing insights, and a checklist template for documenting the patterns selected by the group to inform the overall Liberating Voices initiative. The next article will lay out the team work sessions.